Quite an achievement! 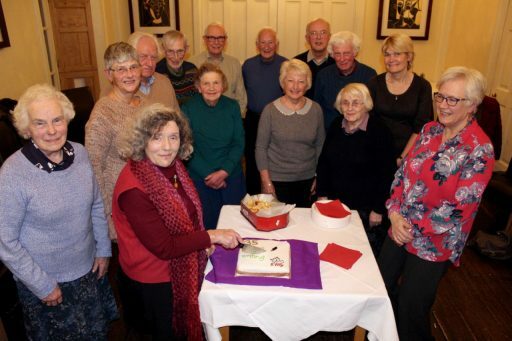 Ripon Writers’ Group owes its long existence to the inspiration of founder member Daphne Peters, seen here cutting the anniversary cake. Daphne described how the group had grown out of a Further Education class that she had run which, although doing well, had been axed after two and a bit years. She had been asked to continue running the class privately but did not want to. Starting a Group was the alternative suggested by one of the class members and made possible when another offered the use of her house for meetings. After building up cash reserves from subscriptions, meetings moved to hired venues two years later although there were always cost problems. Fifteen current members attended the celebration and six sent apologies. 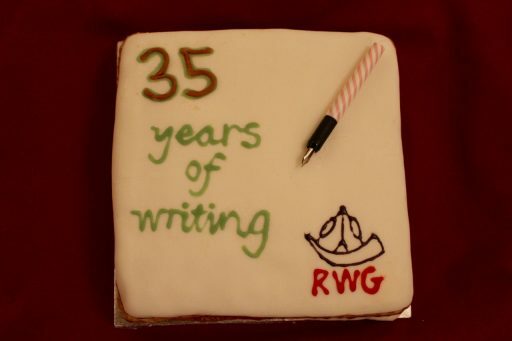 Those who had known the Group over a long period of time shared their reminiscences and everyone was invited to contribute a personal vision of ‘the next 35 years’. The splendid anniversary cake was baked by Ella Benigno and iced by current Chair Sheila Whitfield. In addition, Kathleen Atkinson provided an iced sponge. 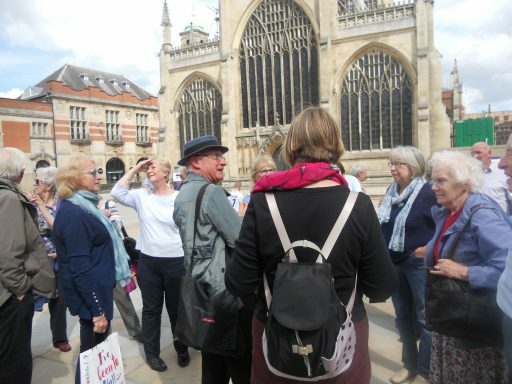 Now the first Ripon Poetry Festival is coming to a close, it’s time to reflect on how well it went for Ripon Writers’ Group. 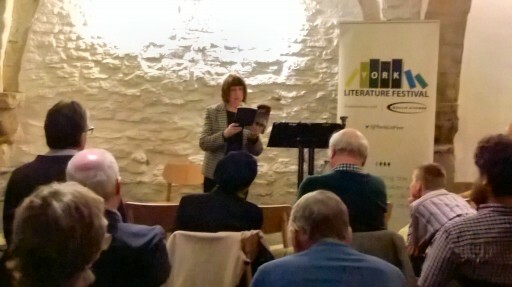 First, a big thank you to everyone who contributed to our ‘showcase’ event this afternoon, especially to those members who were free to come and read out all our pieces. The wide range and differing styles of our poetic efforts seemed to go down well with the audience, as there really was something for everyone to enjoy – and they appeared to do so. 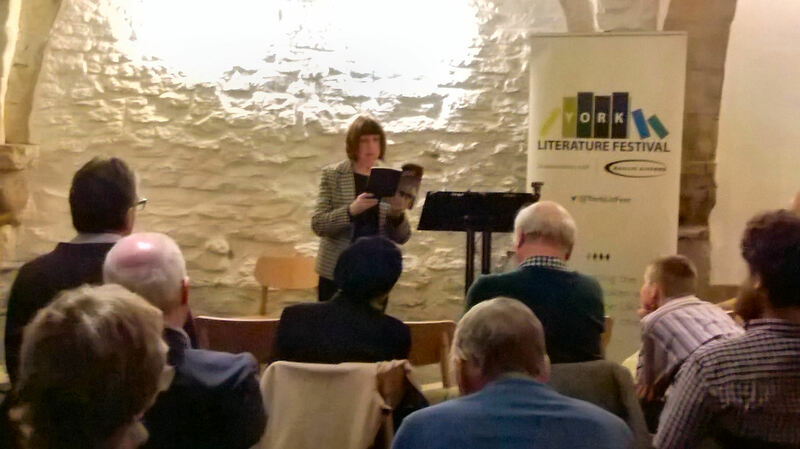 Last night some of us saw Elizabeth Spearman and David McAndrew in their guise of judges in the festival poetry competition. What an amazing range of work for us to listen to. The evening was full of happy, smiling faces, so well done with your choices, Elizabeth and David! Today we saw David again alongside Ian Gouge, who along with Andy Croft were reading from their latest publications. It felt to me that the audience were responsive to the depths and nuances in David’s and Ian’s work, and hopefully would purchase some in order to study and reflect on it later, as it deserved. 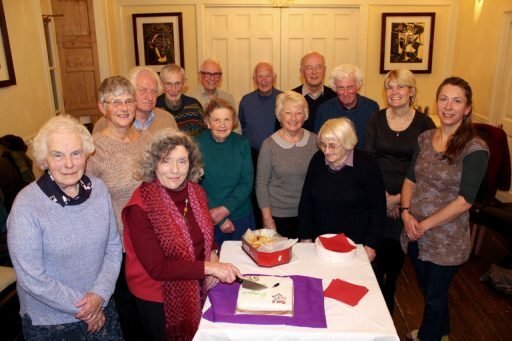 Last but definitely not least, Anna’s talk about how she had compiled her ‘Rural Voices’ stories from Nidderdale was a delightful hour of dialects, old photographs and Dales characters reminiscing. Anna quoted something to us during her talk- ‘stories connect us, they build bridges’. With her oral history compilation, she has undoubtedly provided us with a bridge that will take us back in time, so that ‘times past’ will not be ‘times forgotten’. Thank you all for your efforts over this weekend. I feel very proud to be your Chair! The rain didn’t stop a coachload of RWG and Bedale U3A members from enjoying their day, efficiently organised by Susan Perkins. 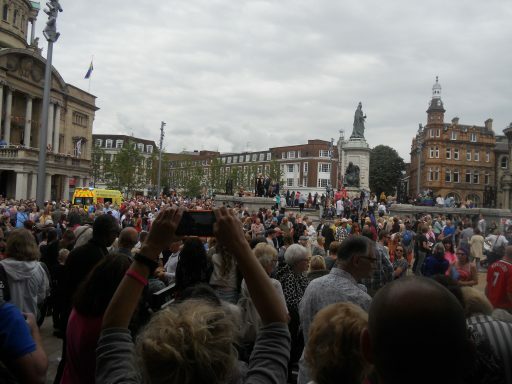 As you can see from the above photo, Hull’s status as City of Culture 2017 has attracted very many extra visitors this year. There was plenty to see and do, so people went their own separate ways for most of the day. 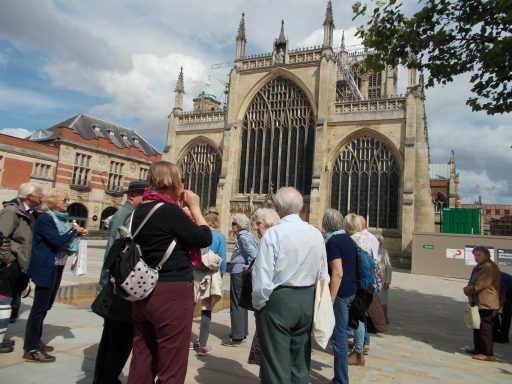 Some chose to admire the architecture of the 14th century Holy Trinity Church, now Hull Minster. 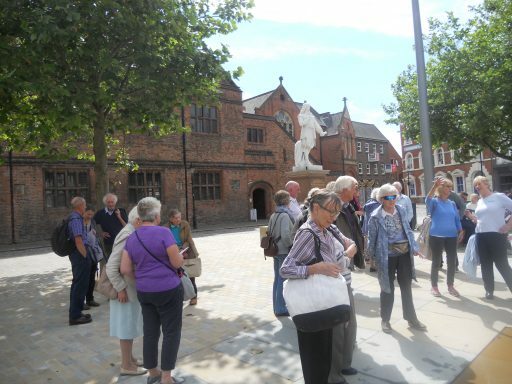 It is the oldest brick-built building in the city and there are claims it is the largest parish church in England. 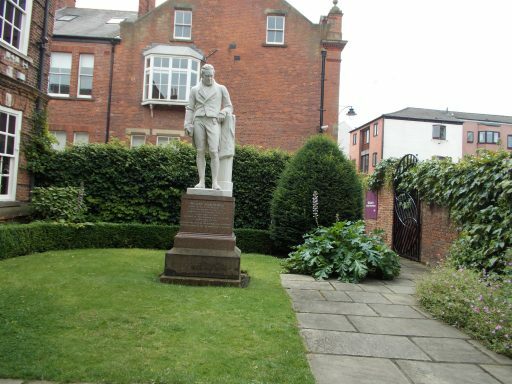 The politician and philanthropist William Wilberforce is one of the city’s most famous sons. Wilberforce House charts the history of slavery and its eventual abolition. 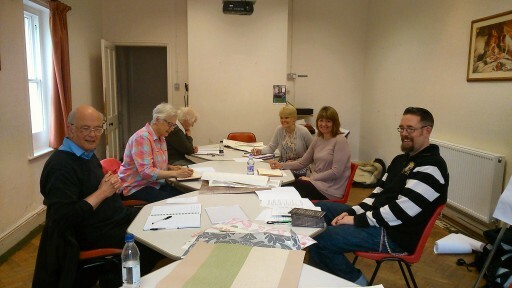 We invited Steve Toase to lead our workshop this year, which took place at the newly refurbished St Wilfrid’s Community Centre. 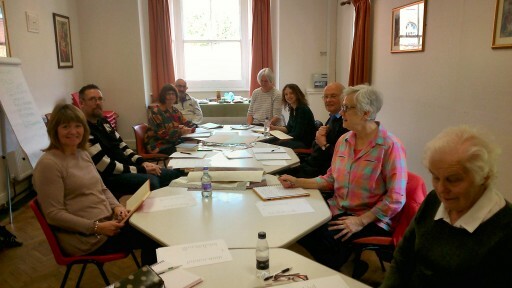 The morning was given over to flash fiction, one of Steve’s specialities, and he gave us plenty of inspiration for a series of writing exercises. After a buffet lunch, Steve turned to the dark side and we enjoyed responding to different stimuli in order to produce edgier work. Steve was at pains to stress that dark tales don’t have to be set in conventionally sinister surroundings. A sunny pastoral scene can hold quite as much horror. Heads buzzing with ideas, we all felt that it had been a very worthwhile day. Andy presented David with the trophy. Sheila then invited Andy to read from his own work. He chose to read an extract from ‘Letter IV’ the latest instalment of a series of verse letters to the deceased poet Randall Swingler using a verse form derived from ‘Don Juan’. This letter updated Swingler on what is happening in the world, in particular the rising hatred of those outside the tribe (Brexit, Trump, Le Pen, etc.). Jan summarised another successful year and thanked the Committee for assisting her. 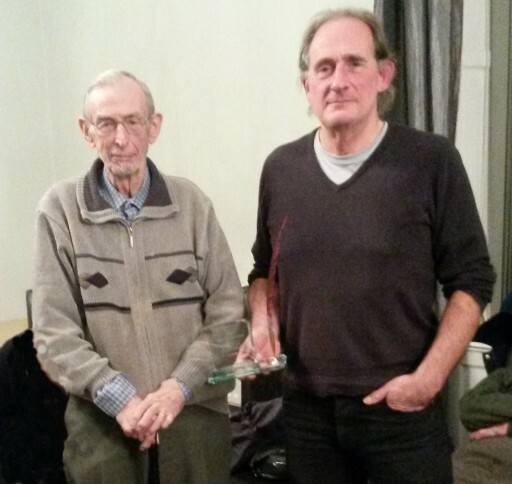 In particular, she referred to the links that had been established with poet Andy Croft and expressed the Group’s thanks to Cathy, who was stepping down as Treasurer after a very long stint. Cathy’s final act in the role was to suggest a new annual membership fee of £24 and this was accepted. Programme ideas for the coming year were taken and further suggestions will continue to be welcomed until the start of January 2017. Joe, as outgoing President, expressed thanks to the three members who were leaving the Committee – Jan, Cathy and Peter H – and presented them each with a small gift. The rest of the evening was devoted to routine business and readings.